This Presentation Template with Stick Man Figure eye-popping pre-made template will help you restructure your data into memorable images and add clarity to your presentations and reports. While these graphics are pre-formatted, you can easily change their size and color, and input your own text to make them your own. It is designed to help you easily create greater visual impact with your PowerPoint and Keynote slides. 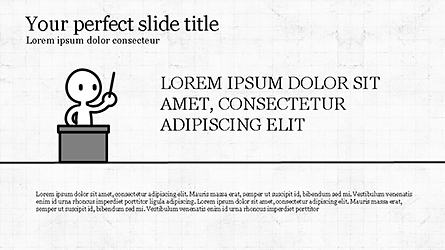 This Presentation Template with Stick Man Figure template simplify using Keynote and PowerPoint. It is easy to follow, and has all the design features you need built right in. Just type in your text, data and that's it! We fuse your message with world-class design to create dynamic, audience-engaging presentations. All of the graphics in this professionally designed Presentation Template with Stick Man Figure presentation template have two types of backgrounds. Choose a light background or a dark one to best fit your presentation's major colors, text and graphics. You can easily switch back and forth between dark and light backgrounds to see which works best for your slides. You have unlimited creative freedom to make as many changes as you like with this Presentation Template with Stick Man Figure professional design template. Edit the text, type your data, customize the colors and create a unique PowerPoint or Keynote presentation that's all your own.